Obituary for Fran DeWispelaere | Esterdahl Mortuary and Crematory, Ltd.
Francis “Fran” Charles DeWispelaere of East Moline died peacefully surrounded by his family on November 29th, 2018 at Clarissa C. Cook Hospice House, Bettendorf. He was a loving and devoted husband, father and friend to many. A Funeral Mass will be celebrated at 10 a.m., Tuesday, December 4, 2018, at Christ the King Catholic Church, 3207 60th St, Moline. Visitation will be from 4-7 p.m., Monday with a liturgy service at 3:30 p.m., at Esterdahl Mortuary & Crematory, Ltd, 6601- 38th Ave, Moline. Private Entombment at St. Mary’s Mausoleum in East Moline. In lieu of flowers, memorials in the name of Fran DeWispelaere may be sent to Arc of the Quad Cities, 4016 9th St., Rock Island, or Clarissa C. Cook Hospice House. 2546 Tech Dr., Bettendorf, IA 52722. He was born at home in Geneseo, IL to Elizabeth A. (Née Loncka) and Cyril B. DeWispelaere. 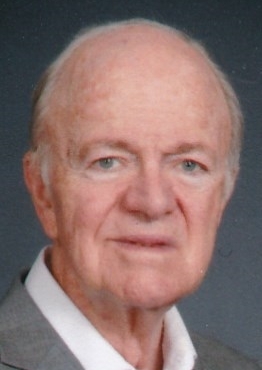 He graduated from Geneseo High School in 1955 and St. Ambrose College in 1960. He married the love of his life, Marie Carol Diana in Crystal Lake IL and they had four children. Fran worked at 1st National Bank before moving on to John Deere (JDIL) where he managed the overseas accounts for Central and South America. Retiring from Deere, after 25 years, he went on to retire from Target in Moline. Fran was active in his Church community, serving as a Cantor and Choir member, a Leader for T.E.C. and Cursillo weekends while a member of Sacred Heart. As a couple, he and Marie led many Marriage Encounter teams. He was currently a member of Christ the King Catholic Church. Fran served as a Board Member for the Arc of the Quad Cities, sang in the Blackhawk College Community Chorale and served as a volunteer for the Putnam Museum. He enjoyed NASCAR and the Green Bay Packers. Fran is survived by his wife Marie of 56 years; sons, Peter (Yvette) DeWispelaere of Rockford, IL and Paul (Lisa) DeWispelaere of Lockport, IL, daughter Christi DeWispelaere of Woodstock, IL; grandchildren Elisabeth, Michael and Benjamin DeWispelaere of Rockford, IL; great granddaughter Olivia Jordal of Lansing, MI; and brother-in-law, Robert (Sharon) Diana of Waxahachie, TX; several nieces, nephews and cousins. He was predeceased by his daughter Lisa Marie DeWispelaere and his parents Cyril and Elizabeth DeWispelaere.